The EU General Data Protection Regulation (EU GDPR) is new legislation that provides a single, harmonized data privacy law for the European Union. With the increasing risk of data breaches from cyber attack, the EU GDPR aims to prevent the loss of personal data by improving data security for all individuals living in EU member states. UK organizations have until May 2018 to comply with the new law, or potentially face fines of up to 4% of annual turnover or €20 million. The one-day Certified EU General Data Protection Regulation Foundation classroom course provides a comprehensive introduction to the EU GDPR, and a practical understanding of the implications and legal requirements for UK and EU organizations of any size. 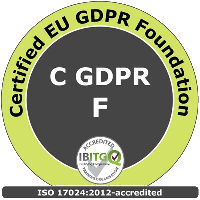 The course supports professional development and delegates who pass the included exam are awarded the ISO 17024-accredited EU GDPR Foundation (EU GDPR F) qualification by IBITGQ. It is also accredited by the Institute of Information Security Professionals (IISP) and satisfies the IISP Skills Framework requirements at Level 1: A1, A2, A3, A4, A5, A6, A7, B1 and C2. Click here for the full course description or to register.